The IFC Mall’s no stranger to speciality coffee, with % Arabica on the third floor and Fuel Espresso on the second, along with multiple multi-national chains. While you’re not short of choice, Seesaw, which opened mid-2017, is the pick of the bunch. Part of the IFC complex, it’s just across the river from the Bund, in the heart of Pudong’s tourist zone. Next to the Oriental Pearl Tower and above the Lujiazui stop on Metro Line 2, it’s perfect for a coffee break. Arriving by metro, take Exit 6 and, once you reach the mall, go up one level. Alternatively, from the Oriental Pearl Tower, descend to the open-air basement, where you can enter the mall. Either way, you’re at the mall’s western end, with Seesaw at the eastern end, where you can also enter, down a long flight of steps to double doors that open almost on top of Seesaw. In some ways, this is my favourite route, since from the top there’s a fabulous view of Shanghai’s three tallest buildings, Jin Mao (1999), Shanghai World Financial Center (2008) and the Shanghai Tower (2015), each being the tallest building in China when it was completed. Seesaw occupies an open, right-angled triangle, anchored against a wall at the back, from which project four thin, metal two-person shelf-tables. At the right-hand end, after a small gap, a short counter runs at 90° to the wall, ending a large, square pillar. This has the cakes (wall end) and the till/menus (pillar end). It’s also the first thing you enter if you come via the mall. There’s also a small retail selection off to the right, past the counter. A longer, second counter completes the triangle, running from the pillar to almost the left-hand end of the wall. This has the pour-over (pillar end), with a three-group La Marzocco Strada espresso machine in the middle, along with its twin Mazzer grinders. There’s space along the front for six bar-stools, ideal if you like chatting with the baristas or enjoy the smell of freshly-ground coffee. Alternatively, for a view of the business-end of the Strada, grab a seat at one of the two left-hand tables. I visited twice, being well looked after by Leo, the manager, and, on my return, his colleague, Ice. 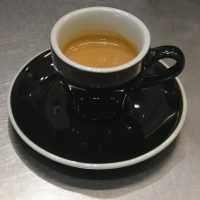 On my first visit, I decide to try the espresso, selecting the Ethiopian Idido single-origin, which was described as “fruity” on the menu, while the Giraffe house-blend was “heavy”. My Idido was excellent, a light, delicate, well-balanced coffee, with fruity undertones. I enjoyed it so much that I wondered about the Giraffe, which, sitting in the hopper, only looked a shade darker roast than the Idido, so I had a shot of that as well. A blend of Ethiopia, Yunnan and Colombia, this was a very different espresso, with a more complex flavour, which I wouldn’t describe as “heavy”. I paired my espressos with a savoury cheese and chive waffle for lunch, which was also excellent, the waffle proving to be quite substantial. On my return, I was drawn to the pour-over. Although Seesaw sources coffee from around the world, I continued my exploration of Chinese coffee with the Yunnan single-origin. The packaging described it as “sun-dried” and “natural”, but I suspect it’s more akin to honey process, the coffee having the fruity notes of a natural, combined with the subtly and clean taste of a washed coffee. Indeed, the first few sips strongly suggested washed coffee, but as it cooled, its fruity, sweet nature came strongly through. I liked it so much that I bought two bags to bring home! This entry was posted in Basements, Breakfast, Cafe/Roaster, Cafes, Cake, Evening Opening, Island Counters, Laptop Friendly, Late Opening, Lunch, Retailers, Shanghai, Shopping Malls and tagged AroundTheWorld2019, include, seesaw by Brian Williams. Bookmark the permalink.